I've been super interested in Nazi history recently. Random, right? 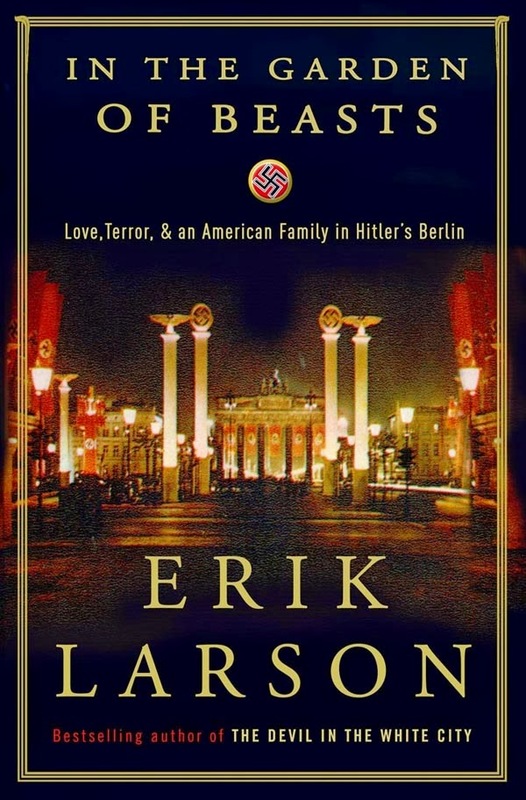 I just finished a book called In the Garden of Beasts by my favorite author, Erik Larson, and it's gotten me very interested in the rise of Nazi Germany. Since I've read quite a lot of Holocaust literature, I'm mostly interested in how the rest of the world viewed Hitler and the Nazis, and how the world allowed it to get so out of hand, especially considering the reputation Germany still had from World War I. As a result, I'm kind of grumpy with Germany at present. I need some happy German reading, pronto! But that's a different post. Because of this new interest, I decided to watch the documentary Forgiving Dr. Mengele. Dr. Mengele was a Nazi doctor at Auschwitz who performed gross medical experiments on the Jews. He was particularly interested in testing things on twins, and Forgiving Dr. Mengele follows Eva Mozes Kor, a survivor of these twin experiments. She and her sister, Miriam, both survived the experiments and were freed from Auschwitz, but Miriam died later on because of the experiments. Mengele had given Miriam something that stunted the growth of her kidneys, so they never grew larger than they were at age 10. Eva still has a lingering eye problem due to being injected with strains of bacteria that Mengele allowed to go untreated, just to see what would happen. Throughout the film, Eva talks about her time at Auschwitz, and she even goes back to Auschwitz with another Nazi doctor, Dr. Hans Münch. Münch was the only person cleared of war crimes at the Auschwitz trials, as witnesses testified that he had a kind attitude toward his patients and didn't do the cruel experiments that others did. While at Auschwitz, Eva gave Dr. Münch a document that declared she forgave him and the Nazis of all crimes committed against her, including killing the rest of her family and the latent death of her sister. She described it as an act of healing. Being able to let go of that hatred and anger and offer forgiveness changed her heart and changed her outlook on life. What's fascinating is how angry other survivors of Dr. Mengele's experiments became with Eva. They were irate that she decided to forgive the Nazis, and they accused her of forgetting what was done to her. As if someone could forget Auschwitz. Really. Eva also opened a museum in Terre Haute, Indiana, called CANDLES Holocaust Museum, which stands for Children of Auschwitz Nazi Deadly Lab Experiments Survivors. And she tours the country giving lectures on the horrors of Auschwitz and the process of forgiveness. I don't call that "forgetting." One man made the point that she couldn't give the Nazis forgiveness because they hadn't atoned for their sins—they hadn't asked for forgiveness from her, so it wasn't hers to offer. I'll admit that I have a hard time with forgiveness sometimes. There are certain things in my life that I kind of refuse to get over. It eats away at me, honestly. I hate it. I want to find forgiveness in my heart, but I also want the guilty party to say, "I'm sorry," and ask for forgiveness. In my worst-case scenario, I forgive them and they say, "Well, I didn't do anything wrong." That would make me crazy. I'm not sure I could hang on to forgiveness after that. But is forgiveness something someone has to want in order for us to give it to them? Or is forgiveness something that just comes from within us? Something that heals our hearts regardless of the other party? The Bible says we need to forgive others because God forgave us, and that if we don't forgive others, we're going to be out of luck when it comes to God's forgiveness. We're not allowed to be stingy with the unwarranted forgiveness God has granted to us. Check out Matthew 18:21-35. It's pretty clear on this issue. But in that story, the guilty party asked for forgiveness, and it was either granted or denied. What happens if someone doesn't ask forgiveness—or doesn't think any wrong was done? I think forgiveness can be one-sided. It's not as comfortable as an "I'm sorry" followed by an "It's OK—I forgive you." But it can be done. What say you? Can you forgive someone who hasn't apologized? I don't know if I could do that. I truly believe ONLY God's grace enables people to handle that situation! Where I work, we have a patient who helped people escape the Nazi's in her house and by underground. Amazing. That's amazing! Like an Underground Railroad! It's a very tough thing to do in some cases. I can't imagine forgiving someone who did such horrible things as in the Holocaust. It just shows how awesome our God really is to give us the ability to forgive for such heinous acts. And if Eva Mozes Kor can find forgiveness in her heart for those atrocities, what's keeping me from forgiving what seems minor in comparison? 'I want to find forgiveness in my heart, but I also want the guilty party to say, "I'm sorry," and ask for forgiveness.' I totally know where you are coming from. I often struggle to know how to forgive, in practical terms. When there is unfinished business, going back to that person could result in more hurt than a resolution (especially if, in my case, I no longer live anywhere near them). The reason I need to forgive regardless of whether the person asks for it or not is because I know it causes bitterness in my heart and it makes me feel uncomfortable in my own skin. So I pray 'Lord, help me to forgive them' I also pray again when hurt feelings rise to the surface when I remember things but I don't know when these feelings are going to go away. I'm not very good at it! I agree--I'm afraid of being subjected to more hurt. Forgiving on my part without having to ask their "permission" or repentance lets me keep the power, you know? And that's part of what gives the healing a chance to work--feeling like you have power over the hurt and the pain. I know God's already got that power available to me, so I don't know what my problem is! I think you can, but it can be difficult to move on if the person you've forgiven hasn't accepted that they've wronged you, and/or remains in your life. I don't, however, think that forgiveness equals forgetting and you don't have to trust the forgiven person again, you can use their actions to inform your opinion of them and act accordingly. For instance, forgiving the Nazi doctors doesn't mean she'd have to accept one as her general practitioner. Very true! Sometimes I have a hard time interpreting statements from the guilty party, though, because my experiences with them have colored my view of them so much. They could say something kind, but I assume it's backhanded just because of my previous experiences with them. Do you think that goes away with forgiveness? That is tough for me. I want them to ask. In asking they kinda hitch me into having to forgive. Sometimes I need that motivation. BTW If you're interested, there is a lot of Nazi ties down here in Paraguay. Legend has it they gave amnesty because their population was decimated in the Triple Alliance war. I have seen a lot of Nazi memorabilia. Forgiving others who aren't sorry is probably the hardest thing to do. I have to keep remembering that is exactly what Jesus did. He died for us when were yet sinners. My favorite Nazi Germany book is the Hiding Place about Corrie Ten Boom and her family and how they helped so many people but then were put in the camps. She tells a story later in life about meeting one of the German soldiers and how hard it was to put out her hand in friendship and this man was asking for forgiveness. When we're wounded we forget that we have no right to ignore God's command to love others. Excellent reminder, Ali. He was ready to forgive us when we weren't sorry---when we weren't even born yet! Maybe I should take on a policy of pre-birth forgiveness...? I think we have to be willing to forgive regardless of the response of the offender. True forgiveness is one-sided. You do it to unburden yourself of anger, bitterness, and the need to carry out justice. If you're a Christian, you also forgive as a simple act of obedience to the God who forgives you. That being said, forgiveness is a gift. The person who has offended against you can choose to receive it. But they can't benefit from the gift until they acknowledge they need it. That's the piece of the forgiveness puzzle we can't control. Our responsibility is to offer it up. Should the person who hurt you deny the gift, he or she is stuck with the burden of the offense. This, of course, is true of our own response to God. The part of God's forgiveness that's immensely costly to us is accepting that we need it, and coming clean about why we do. Thanks for your post, and the reference. I'm going to watch the documentary. So if you choose to forgive someone, do you actually have to tell them of your forgiveness? That's the part where I'm afraid they'd say, "I don't need it, I didn't do anything wrong," and my heart would harden toward them again. If I'm just doing it for myself and to lift my own burden, do they need to be informed? Yes, you should tell them you forgive them. Just don't have any expectations. I say, "it's my turn to talk and your turn to listen". "I forgive you, not for you, but for me. I release you from all the harm you did. You don't have to answer to me. But you will answer to God at the judgement seat of Christ. Whether you believe it or not.". And if you truly forgive this person you might tell them how they can come to Christ now and repent. Then and only then will Christ wash their sins away. If they don't, their sins will be presented to them and they will be held accountable. The time is short for all of us. We don't have time to not forgive. I did it in a letter. It is done and I am free. Amen! Great post! As a Christian who is OBSESSED with history and WWII, I recently got to meet Eva. She is AMAZING in person. And also, C.S. Lewis said it best: "Everyone says forgiveness is a lovely idea, until they have something to forgive." Forgiveness definitely isn't easy. Anyway, if you want a good Christian Holocaust fiction, Tricia Goyer's novels From Dust And Ashes and Night Song are amazing! Her characters are realistic, and they are very well-researched. I have traveled with Eva to Auschwitz and I have heard strangers say to her, "I don't understand how you can forgive. I'm a Christian, but I cannot understand because they don't deserve it." Eva's response always is, "Don't I deserve to be free from the pain they have caused?" For it, forgiveness has nothing to do with the perpetrator. It's about the person who was the victim and what that person needs to do in order to have a soul that is lighter and happier. Strangely enough, some of the best moments I have ever experienced have been on the grounds of Auschwitz with Eva because I see first hand the affect her spirit and her genuine forgiveness has on people. Anyone reading this should STRONGLY consider doing whatever it takes to go with Eva to Poland and/or Romania in June 2014. The experience is life changing. You do not come home the same person you left as. Well, we didn't deserve God's forgiveness, but Jesus died to give us just that. As Christians, that should be in the forefront of our mind when it comes to forgiving others. Doesn't make it any easier, but it compels us to try harder! And I didn't know you could accompany Eva on trips! I'll have to look into that! Thanks, Beth!